very nice long board. I like the graphics. Now I think you must have been following me around a good share of my life. I spent 5 years (1959-1963) growing up in the town of Venice, Calif. about 3 miles from the beach. [It was all muscle-men then. The beach was dirty, and even the pier was mostly dangerous until they build P.O.P. – Pacific Ocean Park – the amusement park. Even Lawrence Welk was gone by then. POP is in the grossness of Santa Monica! Okay, maybe that’s so. But Lawrence Welk was STILL gone from the Aragon Ballroom by then..
Ahhh to be 23Again. Seems like many ages ago………… P.S. 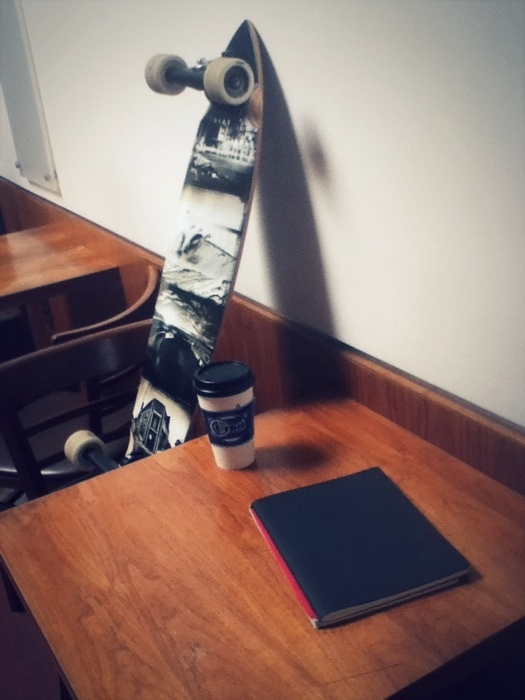 I Like the board…. I am a SoCal gal who has been here since 1969. Venice was, and is, a great place to play in or just walk through! I want to thank you for your idea, which I used for my birthday posts (“Age 67, Ashtabula, or, Any Place I Hang My Hat” parts one through four). My blog is obviously very much more talkative than yours, but as they say, “a picture is worth a thousand words.” I love your picture posts!